RadarGolf Ball Location System | OhGizmo! Thanks to the RadarGolf system you golfers will never lose another ball again, though you will have to jump through a few hoops for it to be really useful. The system uses BPS, or Ball Positioning System technology, along with three key components to make it easy to locate a wayward ball. Both the special RadarGolf balls and the handheld receiver use RF signals to talk to each other, and when located an LCD display and an audible tone on the handheld unit will help you pinpoint in what direction and how far away your lost ball lies. According to their site the special RadarGolf balls meet all USGA specifications for size, weight, distance, initial velocity and symmetry, and the embedded transmitter chip is small enough that it doesn’t affect the ball’s performance. However, the balls don’t each have a unique RF signal, so the handheld receiver will actually detect all the RadarGolf balls in its vicinity, even if they’re in your golf bag or your pocket. So the balls that aren’t in play have to be stored in a special ‘Shield-it’ pouch that’s made with a metallic fabric to block the RF signals. It’s not a major inconvenience, but I can’t see the system being that useful if too many people are using it on the same course. 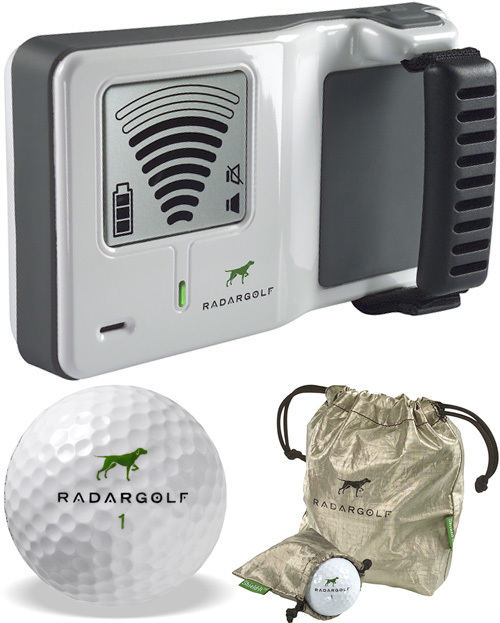 A RadarGolf starter kit which includes a dozen balls, the handheld receiver and a couple of Shield-it pouches runs $199.95, while a dozen replacement balls (if the system really works why are these necessary?) is $39.95. You have to replace the golf balls every so often because, like other sports equipment, they wear out.They take a large amount of force over a very small area, and it doesn't take many holes before they chip, scratch, and warp to the point they will no longer fly true. OK, now lets see something completely useless. Also you have to replace them when you find them in the lake or some area a golfer doesn't feel like venturing to. I think I know a friend I have to link these too. Her father would love these. Another issue I just thought of, what happens when these become popular. How can you tell if your locating Jimmy's ball or Timmy's? And what happens when they start leaving them in the lake and there are a good handful in there. Wouldn't the RadarGolf system go crazy.